Swiss Gold "Fire and Smoke" - "Sermons On the Mount" and "Sorcerers Apprentices"
Swiss Gold "Fire and Smoke" - "Sermons on the Mount" and Sorcerers Apprentices"
Central bankers reached a new low overnight when Swiss National Bank President Thomas Jordan warned of "disastrous consequences" from a pulpit in a church on a historic hill in the town of Uster, Switzerland. The separation of church and state was one of the great achievement of recent years. It looks like we need to see a proper separation of central banking from the state. States and sovereign nations should be in control of central banks, rather than the other way around. Central bankers and their dogmatic Keynesian money printing creed would like to see themselves and their policies as infallible. Despite, such policies having an abysmal track record throughout history and indeed in recent years. Central bankers seem to have forgotten that their primary role is to protect the purchasing power of their respective currencies and not to boost asset prices on behalf of corporations and the wealthy - thereby, debasing sovereign currencies. In the words of the great Rage Against the Machine song, "Hungry people don't stay hungry for long, they get hope from fire and smoke as they reach for the dawn." The majority of Swiss people are not hungry, Switzerland remains one of the wealthist nations in the world. Although the working and middle classes are seeing significant inflation in the cost of life's necessities in the form of food and accommodation - to buy or to rent an apartment or house is becoming increasingly un-affordable. The Swiss being the Swiss don't need fire and smoke, rather they simply have a referendum and allow democracy to decide the matter. However, the yes side and although those who believe in the virtues of sound money and ills and risks of currency debasement will be hoping for some democratic fire and smoke this Sunday. A victory for the yes side will lead to plenty of "fire and smoke" in the gold market and an earthquake in the global financial and monetary system. The vote is set to be very close. Polls on such sensitive political and economic matters are frequently wrong. In Europe many official polls showed people in various European countries would vote for the EU's Lisbon and Nice treaties. People who were allowed the opportunity to vote often voted against the political machine. There is a lot of discontent and anger against political establishment and our sense is that the Swiss people may give the politicians another bloody nose ! There is just over one week to go before the Swiss gold initiative referendum on Sunday 30 November. The release of the latest opinion poll earlier this week shows a strengthening of opposition to the initiative at the expense of the yes camp, with the level of undecided voters still a significant component of the equation. Taking the ‘maybes’ into account, there are still, according to the latest poll, 37% of voters who are not definitely yes or definitely no at this stage. The official pollsters believe that the initiative will likely fail, and perhaps, at this stage they are correct. The intervention of the Swiss National Bank (SNB) into the campaign at every turn seems to have dissuaded some previously ‘yes’ leaning voters. However, the SNB is still not taking any chances and continues to make statements on what it see as the dangers to Swiss monetary policy from increased gold reserves in the form of a 20% gold minimum in the reserves, and a ban on gold sales if the initiative does go through. The SNB governing board members are also having to contend with a Euro to Swiss Franc rate (EUR/CHF) which has now approached and arrived at the SNB’s Maginot Line, even as the gold and foreign exchange markets perceive that the ‘threat’ of the gold initiative may be about to subside. While investment bank commentary and research is in the majority thinking that the gold initiative will not succeed, recent weeks have seen increased coverage and analysis of the referendum event by the currency and commodity strategists of major banks and trading houses. 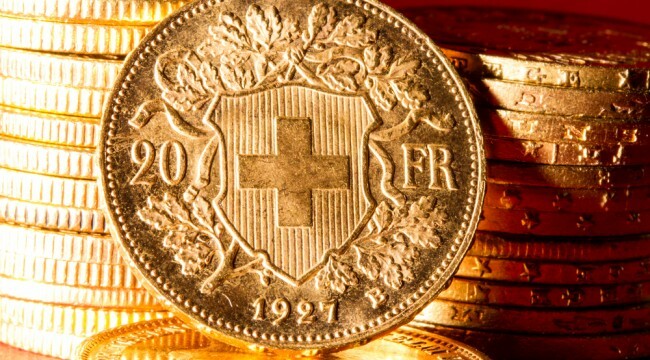 Even if the Swiss gold initiative fails and its proponents don’t achieve their desired outcome, the initiative will still be seen in some quarters as an historic event that panicked the Swiss National Bank into a coordinated campaign of opposition and that made currency strategists and financial media around the world sit up and begin to analyse what they may now realise has always been a world class currency in its own right. No matter what you think of Greenspan, he knows that gold is the world’s premier currency, as do the governing board of the SNB. But whereas Greenspan is now free to say this, the SNB board look too afraid to admit this. Wednesday 19 November saw the release of a new opinion poll addressing the upcoming Swiss gold initiative referendum. This poll, the second of two polls from well-respected political research institute gfs.bern, and the only officially conducted poll on the Swiss gold initiative, is the final poll before the 30 November referendum. The gfs.bern survey, which follows on from a similar poll released on 24 October and was conducted on behalf of Swiss state broadcaster SRF, found that 38% of respondents would vote yes to the gold initiative, 47% would vote no, and 15% were still undecided. The previous poll from gfs had found 44% in favour, 39% against, and 17% undecided, so there has now been a 6% swing away from the yes side, an 8% gain for the no side, and a 2% reduction in the undecided camp. With the previous gfs poll having been published four weeks previously, it appears that campaigning from the ‘No’ coalition of political parties and the Swiss National Bank has had a noticeable impact on the Swiss electorate’s thinking. However, the results also show an electorate that is still someway off from full decisiveness on the Swiss gold reserves issue. Technically, survey respondents to these Swiss surveys can answer these polls in one of five ways, and there are two extra response categories for those who ‘might’ vote either yes or no but who are still not entirely sure of their intention when responding to the survey. Then, for each side, the pollsters add the ‘definitely’ and ‘maybe’ categories together. This is best illustrated by the full gfs.bern survey results which were as follows: definitely yes 27%, probably yes 11%, definitely no 36%, probably no 11%, and undecided 15%. Interestingly, this gives a figure of 37% who are, at this stage, not completely definite on how they would vote. Throughout this gold initiative campaign, another separate on-line poll has also been conducted on behalf of media publication ‘20 Minuten’. The latest gold initiative results from 20 Minuten’s online poll, released on 18 November, showed the Yes vote at 28% versus the No vote at 64%, with 8% undecided. This poll also adds a definitely and a maybe together, for example 'tend to yes' and 'yes' together become ‘yes’. The previous 20 Minuten poll on 31 October showed 38% yes, 47% no and 15% undecided, so according to 20 Minuten, ‘Yes’ has dropped 10 percentage points while 'No' has gained this 10% plus another 7% from the ‘Undecided’. As per usual in the non-stop Swiss election and referenda calendar, two other referenda are taking place in Switzerland on 30 November in addition to the gold initiative referendum. Both of these referenda were also surveyed in gfs.bern’s two polls, and there were also noticeable swings in the latest survey results for both of these referenda. In the Ecopop initiative, which broadly deals with immigration issues, there was a positive 4% swing in the Yes vote from 35% to 39%, with the No and ‘Undecided’ both losing 2% each. In the third referendum, on lump sum taxation for rich foreign nationals, there was a 6% drop in support (6% drop in the Yes side) from 48% to 42%. Therefore it was not just the gold initiative survey results which swung dramatically over the one month measurement period. Gfs.bern also breaks down its poll results by various different criteria, including region (German, French, and Italian speaking), by political party, and by income level. An Italian leaning towards gold? Although Switzerland is a multilingual country, each area is officially classified into the German, French or Italian speaking regions, thereby creating three regions. The poll shows that in Italian speaking areas, the yes vote was actually ahead with 47% in favour, versus 28% against. In the German speaking region, the results were 40% yes versus 50% no, while in the French speaking region it was 29% yes versus 41% no. The ‘Undecided’ were a low 10% in the relatively decisive German speaking region, 24% in the Italian region, and a significant 30% in the relatively indecisive French speaking region. Including the ‘maybes’, then the total combined non-yes and non-no cluster was 33% in the German, 44% in the Italian and 56% in the French region. Therefore, there is still a lot of scope for change in the actual referendum given the large number of respondents who did not give a definitive yes or no answer in the latest poll. Even though the gold initiative campaign was launched by representatives of the Swiss People’s Party (SVP), following a closely contested party vote, the central SVP membership structure decided not to officially recommend a ‘Yes’ vote. However a lot of the local cantonal SVP party chapters, after their own local votes, did decide to support the initiative. This means that although none of the main Swiss parties actually endorse a ‘Yes’ vote, there is still grassroots supports for a ‘Yes’ vote amongst many SVP parliamentarians and SVP supporters within the Swiss electorate. This was reflected in the findings of the gfs.bern poll, where, amongst SVP voters, 62% said they would vote for the initiative, while 32% said no. Voters of the other four big parties only indicated yes votes of between 22% and 27%, and no votes of between 58% and 64%. These parties were the Greens, the CVP, the SP, and the FDP. Of respondents without a party affiliation, 29% said yes, 29% were undecided, and 42% said no. All of these party allegiances, as well as the non-aligned vote, were influential in strengthening the overall ‘No’ vote intentions. However, it’s worth remembering that in the February 2014 popular initiative on Swiss immigration, the ‘Yes’ vote gained a slim majority of 50.3% despite all the main political parties, apart from the SVP, recommending a ‘No’ vote. There were also differing trends in support for the gold initiative amongst income classes in Switzerland, as measured by household income. Those on lower incomes displayed higher support for the gold initiative compared to those on higher incomes. Amongst respondents with monthly household incomes below CHF 3,000 (€2,500), 52% would vote yes versus 28% no, between CHF 3,000 and CHF 5,000 per month 56% would vote yes and 33% no, while above CHF 11,000 per month (€9,160), only 21% would vote yes and 64% no. The gfs.bern survey (via telephone) was conducted by interviewing 1,412 voting residents of Switzerland between 7 November and 15 November. This did not include Swiss expatriates residing in other countries (Swiss expats can vote in Swiss elections as long as they are registered in their home commune, and as long as they vote via their local Swiss consulate or embassy). Approximately 2.6% of the Swiss electorate are registered abroad. For example, in the February 2014 referenda, out of 5.21 million eligible voters, 137,000 were registered as being abroad. The gfs survey actually asked respondents how they would vote if they were voting the next day, and was open not just to those who intended to vote or had already voted (note that in Switzerland a lot of people vote by post in advance). Of the survey respondents, 52% said they would actually be voting on the three referenda on 30 November (or had already voted). Gfs.bern says that a 52% turnout is about average for elections in the last year, and this indication is an improvement on the last poll, during which 47% of respondents indicated that they would vote. As an example, in the February 2014 immigration referendum, the turnout was 56.57%, with 2.91 million people voting. Following a Swiss TV debate about the gold initiative conducted in German last week, another television debate addressing the initiative was held earlier this week, this time in French, and hosted by Radio télévision Suisse (RTS) part of the SRG Swiss Broadcasting group. The transmission included various representatives from both sides of the initiative debate including Luzi Stamm, the SVP lead of the yes campaign, Yves Nidegger national councillor with the yes campaign, investment manager Egon von Greyerz, also of the yes campaign, and Jean-Pierre Roth, a former chairman of the Swiss National Bank representing the no campaign. Throughout its campaign, the SNB has pleaded that the ‘rules’ required by the gold initiative wording would stifle the flexibility of its monetary policy as regards fx interventions. This argument focuses on two connected points Firstly, the SNB argues that if, while tackling deflation, it expanded its balance sheet while defending the EUR/CHF rate, then it would, under the 20% rule, also have to buy more gold so as to keep the gold cover ratio above 20%. Secondly, if the SNB tried to contract its balance sheet to counter inflation, that since it would be prevented from selling gold, that it would have to sell other reserves, i.e. foreign currencies, and that theoretically, the entire balance sheet could end up being just gold. While this may be true in the medium term, in a recent report, Commerzbank note that since the gold initiative rules allow the SNB a five year period in which to build its gold reserves towards a 20% level, then in the short term, the SNB can continue to pursue its EUR/CHF defence policy. It also begs the question, how long does the SNB intends to pursue this continuous weakening of its own currency by tying it to a continually weakening Euro. Its also worth looking at how exactly the SNB began their EUR/CHF experiment and what they might do next as regards further intervention. Since the beginning of November, the Swiss Franc has strengthened noticeably against the Euro, with the EUR/CHF rate moving down from 1.206 to just above 1.201, perilously close to the SNB’s 1.200 line in the sand. It may not appear to be a large move but the approach to the 1.201 area is very significant. Indeed, some of this exchange rate move has been attributed to the market’s anticipation of a close race in the gold referendum. Most of the EUR/CHF drop occurred in the first two weeks of the month, and the exchange rate has been flat lining since then just above 1.201 after actually breaching the 1.201 mark on a few occasions this past week. The SNB are terrified about the risks of deflation and the looming escalation of continued loose monetary policy by the European Central Bank which will further weaken the Euro. Inflation in Switzerland is projected to be about 0.3% year-on-year for 2015, and the SNB may need to now crank up the size of its balance sheet to try to induce further inflation back up towards its ‘price stability’ target of circa 2% per annum. This Swiss Franc strengthening has prompted further remarks from the SNB that the Bank will do whatever it takes to defend the 1.20 level. Fritz Zurbruegg, one of the three members of the SNB governing board, said as much at a banking gathering in Geneva on Thursday (20 November), where he reiterated that the SNB would use the ‘utmost determination’ to defend the 1.20 line, by buying unlimited quantities of Euros and also by using other unspecified policy measures. Is the SNB intervening now? Probably not, but it may be making preparations to do so, given that the EUR/CHF rate is currently staying so close to the 1.200 mark. Zurbruegg, whose other role is as head of the SNB department with responsibility for financial markets and banking operations, also used the banker get-together occasion to again try to influence the referendum result, when he encouraged the Swiss electorate to reject the gold initiative on 30 November. One possible unconventional policy measure (for the SNB at least) would be to introduce negative interest rates, thereby making it unattractive for Swiss Franc depositors to make such deposits, which might weaken demand for the Swiss Franc. “The current massive overvaluation of the Swiss franc poses an acute threat to the Swiss economy and carries the risk of a deflationary development. The Swiss National Bank (SNB) is therefore aiming for a substantial and sustained weakening of the Swiss franc. With immediate effect, it will no longer tolerate a EUR/CHF exchange rate below the minimum rate of CHF 1.20. The SNB will enforce this minimum rate with the utmost determination and is prepared to buy foreign currency in unlimited quantities. In the summer of 2012 there was further large scale interventions by the SNB where the Bank bought Euros and added about another CHF 150 billion to the SNB balance sheet (Some of these Euros are then converted into other major reserve asset currencies such as the US Dollar using a weighted target portfolio of currency reserves that the SNB adheres to). “The Swiss National Bank (SNB) is leaving the minimum exchange rate unchanged at CHF 1.20 per euro, and will continue to enforce it with the utmost determination. It remains committed to buying foreign currency in unlimited quantities for this purpose. The SNB governing board now appear to have painted themselves into a corner. With the EUR/CHF rate now at their defining line, there is little that they can do under their current monetary policy except continual balance sheet expansion and purchasing of Euros. No matter whether the gold initiative passes or not, this SNB monetary policy looks unsustainable in the long run. Moving back towards a strong currency partially backed by gold might admittedly cause deflationary issues for Switzerland in the short run, but with other currency blocks globally apparently indicating that they are accumulating gold reserves in order to back their currencies with gold in the medium term, maybe Switzerland could lead the way for other Western economies by using gold in its monetary system in the way that it has historically done. A number of investment bank currency strategists have raised the possibility that the SNB could create a sovereign wealth fund (SWF) so as to lessen the amount of gold it would need to purchase in the event of a ‘Yes’ outcome in the gold referendum. These approaches suggest that the SNB could transfer some of the SNB’s existing reserve assets to a Swiss sovereign wealth fund, thereby reducing the amount of reserve assets on the SNB’s balance sheet, the outcome of which would be that the existing gold reserves would then comprise a higher percentage of total reserve assets. This strategy has been suggested by both Morgan Stanley and Deutsche Bank in recent currency research reports focusing on the Swiss gold initiative. The balance sheet reserve assets of the SNB are currently valued in the region of CHF 520 billion, of which gold reserves comprise approximately CHF 40 billion, or just over 7.5%, of this total. If today the SNB had to bring its gold reserves up to 20% of its reserve assets this would require the purchase of approximately CHF 65 billion in gold. 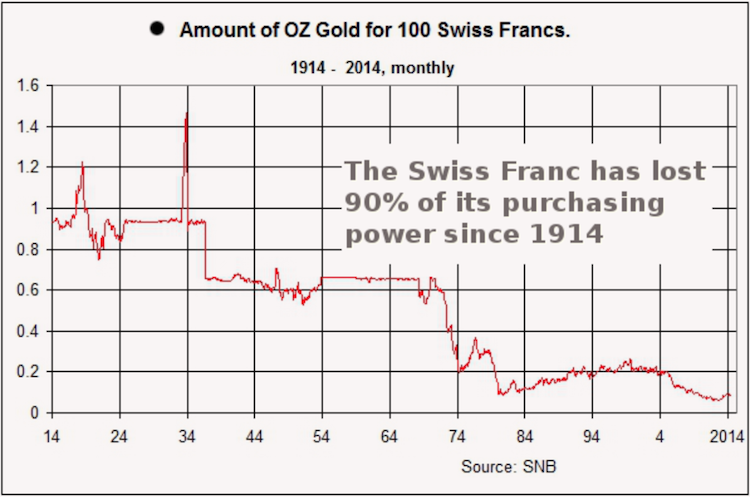 Instead, if the SNB transferred a majority of its reserve assets to a sovereign wealth fund, this would reduce the overall size of the balance sheet and could create a balance sheet where the existing gold comprises over 20% of total reserve assets, thereby negating the need to purchase any gold at all. Deutsche Bank suggests that the SNB could “transfer intervention-related reserves into the sovereign wealth fund as an accounting matter”, and that if these reserves were needed for intervention, then, based on ‘trigger points’ these funds could again “flow from the SWF to the central bank to be used in interventions”. However, such strategies involving a sovereign wealth fund are not politically palatable in Switzerland. Morgan Stanley points out that the transfer of SNB reserve assets to a SWF would be controversial with the Swiss cantons, because the SNB is expected to maintain its reserve assets at a level which enables it to fulfil monetary policy while distributing other earnings to the cantons. If a transfer of reserves that were deemed to be in excess was undertaken with a SWF, the question would then arise as to why the cantons had not received this transfer. Conscious of the controversies surrounding this possibility, the SNB’s Thomas Jordan came out with a statement this week guaranteeing that such a strategy would not be pursued by the SNB if the Yes vote triumphed. Jordan said that such a move was ‘unthinkable’, and he commented that “the SNB cannot simply use some tricks to circumvent the will of the people. I rule that out categorically”. Given that Thomas Jordan is categorically against ‘tricks to circumvent the will of the people’ in a scenario under which the SNB had to increase its gold reserves following a ‘Yes’ majority in the gold referendum, then Jordan should also be expected to be against Deutsche Bank’s other main suggestion in how to allow the SNB to meet the gold initiative 20% rule without actually having to purchase any additional gold. Using round trip gold swap transactions, where the SNB swaps currency for gold with counterparties on a temporary basis, Deutsche Bank suggests that the SNB could borrow gold just before balance sheet reporting dates, thereby making it look like the SNB had increased gold reserves, and then reverse the swap again after reporting day, returning the claim on the gold back to the lending counterparty. Deutsche Bank believes that this swaps strategy would be “politically more straightforward than the introduction of a sovereign wealth fund.” But given that in the opaque world of central bank cooperation in gold trading and pooling, central banks are not even obliged to report the details of gold swap activity, surely Deutsche really means that it would be “politically more straightforward” since no one outside a handful of SNB and BIS gold traders, SNB executives, and BIS governors might even be aware that such a gold swap strategy was even being implemented? And it would also be naïve to think that, in the eyes of many Swiss citizens, the use of gold swaps could in any way be less of a “blatant disregard of the political will” than a sovereign wealth fund, even those citizens who in the eyes of those who might be voting against the gold initiative. With a large minority of voters still seemingly undecided on the gold initiative question, there still appears to be a lot of uncertainty within the electorate. Therefore, with the final few days of campaigning now approaching, the ‘Yes’ and ‘No’ campaign teams may still have one final shot left at making their case to the ‘undecided’ and the ‘maybe’ groupings, as they try to sway these undecided voters over to one or other side of the argument. And with the Dutch central bank, De Nederlandsche Bank, having just announced the completion of the repatriation of 120 tonnes of its gold from the Federal Reserve Bank of New York back to Amsterdam, the Swiss electorate may now be wondering whether repatriation of their 300 tonnes of Swiss gold held abroad should now take on added urgency.